Hello Friends!!! Can you believe that January is over with already? Is it really February? Am I really having a baby in a month? Wow!!! I hope everyone is having a great week. The weather here has been absolutely beautiful here in Cleveland!!!! Typically we are knee deep in snow right now, however, Jillian and I were outside all afternoon yesterday enjoying the 60 degree weather. This is absolutely unheard of here so we were trying to enjoy every last moment of daylight before we had to go inside for dinner. It was so nice to get out of the house, go for a walk, and catch up with the neighbors. Speaking of the nice weather in January, here is what I have been lovin' on this past month! Did I mention it was nice here this Winter? I feel like I am living in Charlotte, NC, not Cleveland, OH in January!!! We have really been giving our snow blower and furnace a break this Winter, that is for sure!!! What a beautiful day we had here yesterday to end the month!!!! Our Homegoods lately has been absolutely stocked with cute home decor accents and furniture lately. One thing that was really lacking in our house was accent tables. I literally had one accent tables in my house up until just recently thanks to Homegoods. How cute is this Apothecary table I found? I ended up purchasing both and found two places in my home where they work out perfectly. I mentioned a few years ago on the blog that I really enjoyed Make Up by Tiffany's blog. If you love make-up and want to learn more on how to properly apply it, then you really need to check out Tiffany's blog. She produces these amazing videos which takes you step-by-step on how to properly apply make up. Her make-up techniques makes it look so easy!! This girl really knows her way around the make-up counter. She is a professional MAC make up artist, and because of this, I really trust her opinion on products she loves. TiffanyD is constantly raving about how life changing Make-Up Forever Mat Velvet+ liquid foundation so I had to try it for myself. I was pleasantly surprised that it was that good! I am not usually a liquid make-up person, however, I was instantly sold on this product. It's a little pricey, however, totally worth it in my opinion. I now wear it every day and just love it. You are probably wondering what the heck Osfoora is. I thought the same thing when I first heard the name. It's a Twitter App that has a lot of fun features that the standard Twitter and Hootsuite App's do not have. The most interesting feature to me was the "Nearby" Screen. You can actually see on a map who is Tweeting near you by all the little blue bubbles. 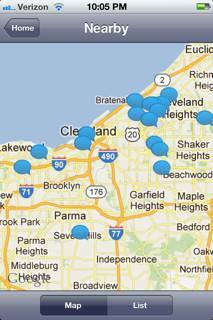 See all the little blue bubbles floating around Cleveland? Those are real time tweets. How cool is that? In addition to this fun iPhone App, I couldn't go on without telling you about my fun new Chevron iPhone screen. I have been so obsessed with Chevron lately, that I was really loving these new Chevron screen's from Southern Stunble. I couldn't decide between these two favorites this month so I thought I would share both of them with you. Amy from All In A Day is actually no stranger to Karen At Home. She was one of my Life of a Stay At Home Mom guest posters this Summer. I really have been enjoying Amy's home decor updates and crafts projects lately. Love of Family and Home is actually a new blog that I have recently come across this month. Tonya, the blog owner, has two adorable little boys and some great taste in home decor!!!! You really have to check out her closet make over, wow!!! Swoon!! I hope you all had an amazing January!!! 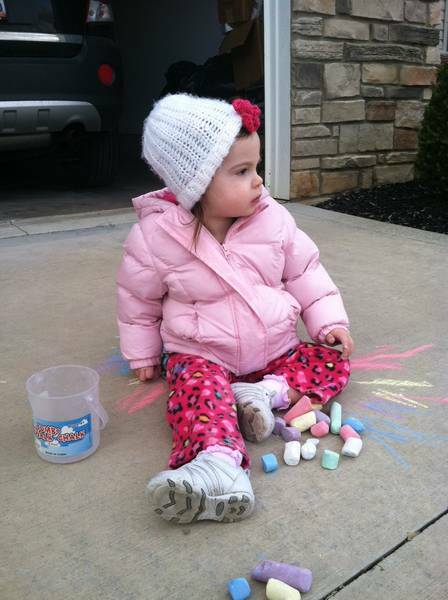 I love Jillian's little hat. And I'm jealous that you have a homegoods near you! which homegoods do you go to? I think I may be in the market for some new decor! Can't believe january is already over... it's going by way to fast! i wanna try that makeup! Our winter has been so warm here in Nashville too! I kinda love it, Ian a summertime girl myself. 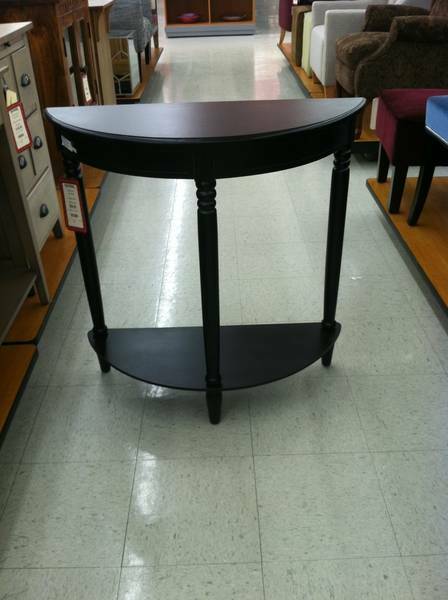 I love those tables, HomeGoods is trouble for me! Thanks for the tip on the chevron I am on the way to scoop that up! A month left? Wow, time is flying. We're having a very mild winter with it being like 70. Truthfully, I'm not in love with it all. I don't really cold, but it makes wearing things difficult, etc. We would love to see how the new pieces work in your home, Karen! I didn't know that you live in Cleveland! We'll be up there in April for a wedding. I've followed you here after your visit to my blog. I'm keeping an eye open for more Command Strip clearance sales next year - great tip! Been here a few minutes and enjoy your blog so much - I'm a gonna follow! 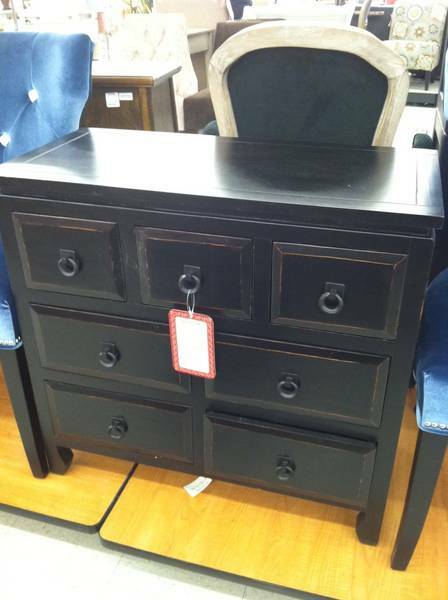 :-) Wish I had a Home Goods nearby - loving the chest!! Our weather has been amazing too. Today it's in the 60's. All of my plants are getting green & my azaleas are blooming!